America's Favorite Gifts™ Start Here! From head-to-toe & throughout your home, Bath & Body Works brings you America's Favorite Fragrances™ with Signature Collection scents, the Perfect 3-Wick Candles, America’s Favorite Hand Soaps™, perfect gifts & so much more! 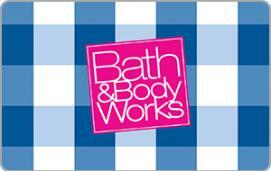 Bath & Body Works E-Gift Cards can be redeemed in-store and online. Print this page & present it to a Bath & Body Works associate at checkout. For mobile, present your phone with barcode or eGift Card number to a Bath & Body Works associate at checkout. For a complete list of the Terms & Conditions click here.